The County proposes to construct the Grandview Connector as Phase I, to be completed no later than seven years from the date of the formal agreement. Spanning just a few miles, the Grandview Connector would provide a link and secondary access for community residents from the Company's Durango Property to Mercy Medical Center and Hospital in Grandview, and would be an alternative route to accommodate increased traffic loads on Highway 160 as the area grows. Phase II will include the Highway 160 Dominguez Intersection Connection (aka the Wal-Mart Intersection) and would be completed no later than nine years from the date of the formal agreement. "The proposed acquisition is part of the County's strategic plan to develop and enhance an efficient, multi-modal transportation system that ultimately compliments local land use strategies," explained Kelly Hotter, Chair of the La Plata County Board of County Commissioners. "This property represents an amazing opportunity for development. It lies adjacent to the City of Durango and sits on a mesa overlooking the City which offers breathtaking 360 degree views," commented Sandra Pautsky of Oakridge Energy. 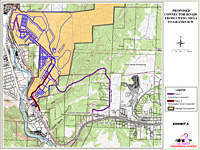 "We are pleased that La Plata County agrees that this area is important to the city's overall development and we believe that the construction of these connector roads will contribute significantly to the future of the site and the Durango community." This Letter of Intent is non-binding until a formal agreement is completed. Oakridge Energy continues to respond to inquiries from developers, investors and other parties with an interest in pursuing the development of its Durango Property, which was platted into 54 parcels of just over 35 acres each in early 2008. Parties with an interest in purchasing the 1,866 acre property should contact Sandra Pautsky, 4613 Jacksboro Highway, Wichita Falls, TX 76301, (940) 322-4772. Headquartered in Wichita Falls, Texas, Oakridge Energy was incorporated in 1969, and has a 40 year history in the exploration, development, production and sale of oil and gas primarily in Texas. The Company also holds the Durango Property as real estate for sale in Durango, Colorado. About this company Oakridge Energy, Inc.